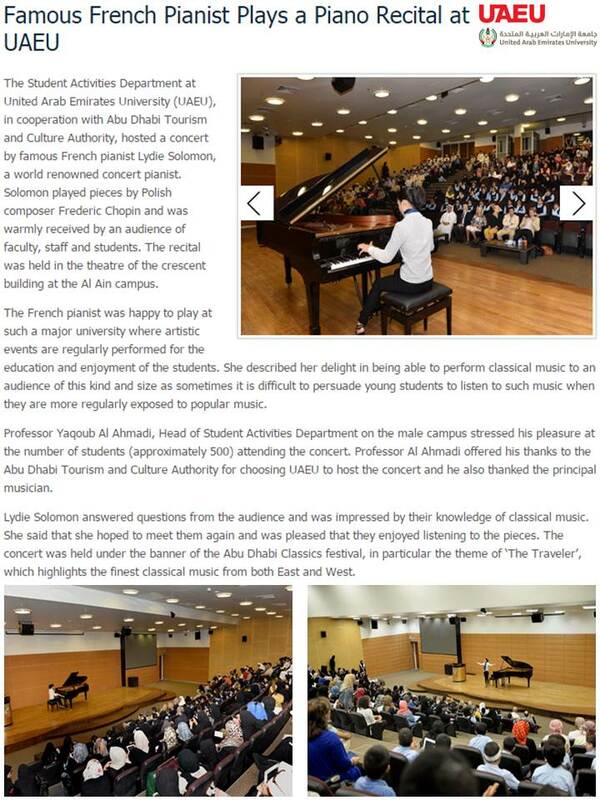 « The Student Activities Department at United Arab Emirates University (UAEU), in cooperation with Abu Dhabi Tourism and Culture Authority, hosted a concert by famous French pianist Lydie Solomon, a world renowned concert pianist. Solomon played pieces by Polish composer Frederic Chopin and was warmly received by an audience of faculty, staff and students. The recital was held in the theatre of the crescent building at the Al Ain campus. The French pianist was happy to play at such a major university where artistic events are regularly performed for the education and enjoyment of the students. She described her delight in being able to perform classical music to an audience of this kind and size as sometimes it is difficult to persuade young students to listen to such music when they are more regularly exposed to popular music. Professor Yaqoub Al Ahmadi, Head of Student Activities Department on the male campus stressed his pleasure at the number of students (approximately 500) attending the concert. Professor Al Ahmadi offered his thanks to the Abu Dhabi Tourism and Culture Authority for choosing UAEU to host the concert and he also thanked the principal musician.